Viking Books for Young Readers, 9780451476418, 44pp. The touching, magical story of a boy in a war-torn country and the stone lion that rescues him. Renato loves his home in Florence, Italy. He loves playing with his friends in the Piazza della Signoria. He loves walking home by the beautiful buildings and fountains with his father in the evenings. And he especially loves the stone lion who seems to smile at him from a pedestal in the piazza. The lion makes him feel safe. But one day his father tells him that their family must leave. Their country is at war, and they will be safer in America. Renato can only think of his lion. Who will keep him safe? 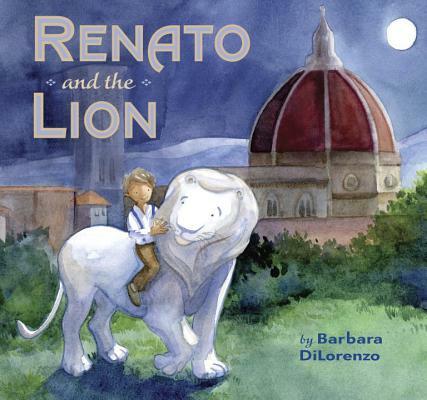 With luminous watercolor paintings, Barbara DiLorenzo captures the beauty of Florence in this heartwarming and ultimately magical picture book. Barbara DiLorenzo fell in love with Florence, Italy, when she first visited as a student at Rhode Island School of Design. Since then, she has returned to visit with her son, who is half Italian, and more recently by herself to paint and do research for this book. An award-winning watercolor painter, she now lives in New Jersey and teaches at the Arts Council of Princeton.